Premier Synthetic Alto Saxophone Reed . They have brilliant overtones for a full, resonant tone, a quick response for better articulation, and excellent pitch stability and intonation. Best of all, they have the same woody tone as cane but with better projection. Fibracell reeds even have the same weight and stiffness as cane (cane floats and so does Fibracell!) but they last up to 4 times longer with no unplayable reeds and aren't affected by heat or humidity. With their high strength and long-lasting durability, they're less likely to give out on you in the middle of a performance, too. What is Fibracell? 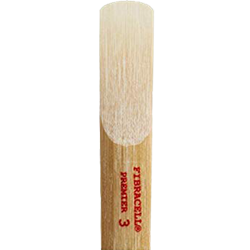 Fibracell is a sophisticated composite of aerospace materials designed to exactly duplicate the way nature constructs the cane that goes into the very best cane reeds. Very stiff but sound-absorbing Kevlar fibers are suspended in a lightweight rosin using extremely exacting production standards. Each reed is precisely machined and trimmed for a consistently perfect shape, so you get the same reed time and time again.